Muscle bike is a nickname for a motorcycle type, derived from either a standard or sport bike design, that puts a disproportionately high priority on engine power. Roadster is an older term, equivalent to standard or naked. Cruisers are styled after American machines from the 1930s to the early 1960s, such as those made by Harley-Davidson, Indian, and Excelsior-Henderson. 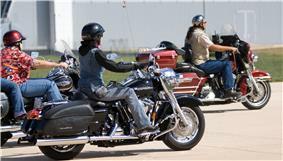 Harley-Davidsons largely define the cruiser category, and large-displacement V-twin engines are the norm, although other engine configurations and small to medium displacements also exist. Their engines are tuned for low-end torque, making them less demanding to ride because it is not necessary to shift as frequently to accelerate or maintain control. Cruisers are sometimes called "custom" even in the absence of aftermarket modifications. Power cruiser is a name used to distinguish bikes in the cruiser class that have significantly more engine output, around 80–100 hp (60–75 kW) as opposed to about 50–70 hp (37–52 kW). They often come with upgraded brakes and suspensions, better ground clearance, and premium surface finishes, as well as more exotic or non-traditional styling. Sport bikes emphasize speed, acceleration, braking, and cornering on paved roads, typically at the expense of comfort and fuel economy in comparison to less specialized motorcycles. Because of this, there are certain design elements that most motorcycles of this type will share. Sport bikes have comparatively high performance engines resting inside a lightweight frame. Inline-four engines dominate the sport bike category, with V-twins having a significant presence, and nearly every other engine configuration appearing in small numbers at one time or another. The combination of these elements helps maintain structural integrity and chassis rigidity. Braking systems combine higher performance brake pads and multi-piston calipers that clamp onto oversized vented rotors. Suspension systems are advanced in terms of adjustments and materials for increased stability and durability. 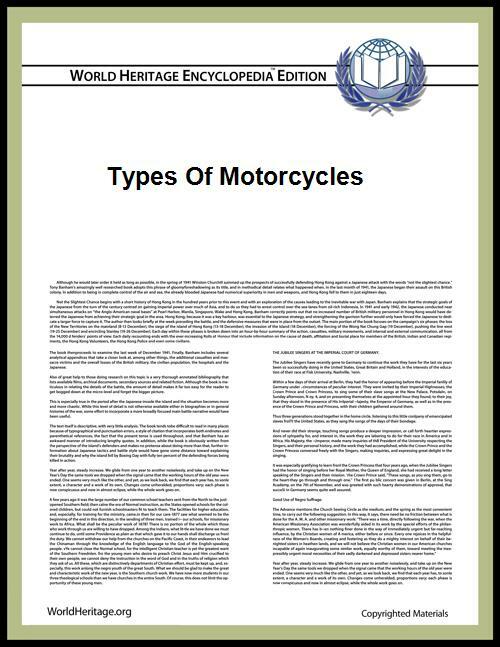 Most sport bikes have fairings, often completely enclosing the engine, and windscreens that effectively deflect the air at very high speeds, or at least reduce overall drag. Bagger, full dresser, full dress tourer, or dresser are various names for touring motorcycles, sometimes used disparagingly or jocularly, and originally referring to a Harley-Davidson or other cruisers with full sets of saddlebags. 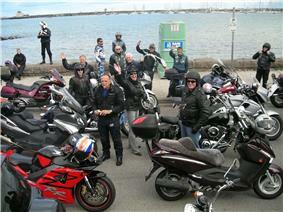 Now refers to any touring motorcycle. 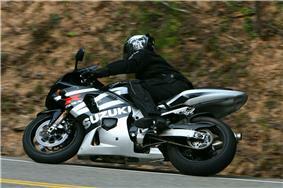 Sport touring motorcycles combine attributes of sport bikes and touring motorcycles. 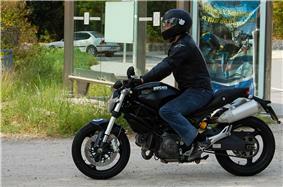 The rider posture is less extreme than a sport bike, giving greater long-distance comfort. 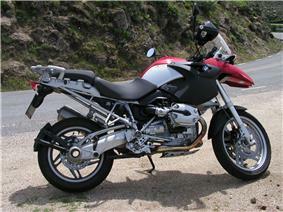 Accommodation for a passenger is superior to a sport bike as well, along with luggage capacity. Being lighter, at 550–720 lb (250–330 kg) wet, than a pure touring bike and often having racier engines, suspensions, and brakes, sport tourers corner better and are more at home being aggressively ridden on curvy canyon roads. The distinction between touring and sport touring is not always clear as some manufacturers will list the same bike in either category in different markets. The Honda ST1300 Pan-European, for example, was listed by Honda as a sport touring motorcycle in the United States and Australia, but as a touring motorcycle in Europe. 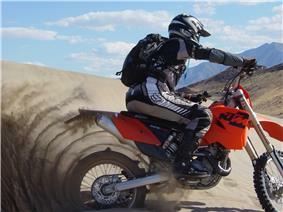 Adventure motorcycles are motorcycles with touring capability on paved and unpaved roads. As a dual-sport they have a significant on-pavement bias and perform well on pavement at higher speeds unlike most dual-sports. Their size, weight and sometimes their tires, however, limits their off road capability. Most adventure motorcycles function well on graded dirt and gravel roads but are less than ideal on more difficult off-pavement terrain. Road racing a Lambretta scooter. 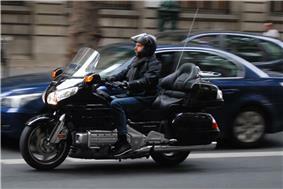 A motorcycle type does not necessarily limit the style in which a motorcycle can be ridden. 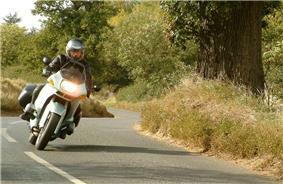 Scooter engine sizes range smaller than motorcycles, 50–850 cc (3.1–51.9 cu in), and have all-enclosing bodywork that makes them cleaner and quieter than motorcycles, as well as having more built-in storage space. Automatic clutches and continuously variable transmissions (CVT) make them easier to learn and to ride. Scooters usually have smaller wheels than motorcycles. 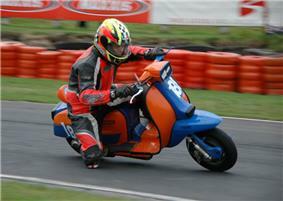 Scooters usually have the engine as part of the swingarm, so that their engines travel up and down with the suspension. Modenas Kriss 120cc underbone. This type of motorcycle is popular in Southeast Asia. Underbones are small-displacement motorcycle with a step-through frame, descendants of the original Honda Super Cub. They are differentiated from scooters by their larger wheels and their use of footpegs instead of a floorboard. They often have a gear shifter with an automatic clutch. Motocross — Such bikes (once called "scramblers") are raced on short, closed off-road tracks with a variety of obstacles. 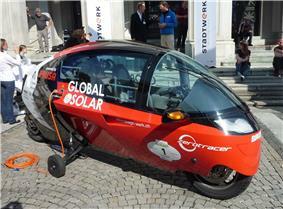 The motorcycles have a small fuel tank for lightness and compactness. Long-travel suspension allows riders to take jumps at high speed. Motocross engines are usually single-cylinder two-stroke or four-stroke units, which vary in size from 50cc up to about 650cc. 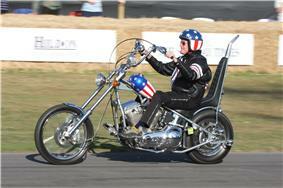 Motocross sidecar outfits have bigger engines, usually four-stroke and often twin-cylinder. Motocross bikes are also used in Freestyle Motocross. Enduro — A modified and road-legal motocross bike, having the addition of a horn, lights, effective silencing and a number plate. Enduro riders compete over a longer course (which may include roads); and an enduro event may last between one day and six days (such as the ISDE). Some enduro events (known as "multi-lappers") are held on rather shorter circuits, not unlike scramble tracks. "Multilappers" are especially popular with novice riders. Trail — A trail bike is a dual-purpose bike, made for on-road and recreational off-road riding. A trail bike may resemble an enduro bike, but since a trail bike is not intended to be used for competition, it may be (i) less rugged, and (ii) equipped with dual-purpose tyres and with more road legal equipment, such as indicators, mirrors and extra instruments. Trials — Trials riding is a specialized form of off-road competition testing balancing skills and precision rather than speed. For a trials bike, low weight and crisp throttle response power are the priorities, so a trials bike tends to have a small (125 cc to 300 cc) engine, two-strokes being common. During the trial, the rider stands on the footpegs, so a trials bike will have only a vestigial seat, or even no seat at all. Fuel tanks are very small, giving a very limited range. Track racing — High-speed oval racing, typically with no brakes, nor rear suspension. The engines, fuelled by methanol, are long-stroke four-stroke singles, such as JAP or Jawa. They have at most two gears. Some types, such as speedway, and grass-track bikes, are designed to take left turns only. 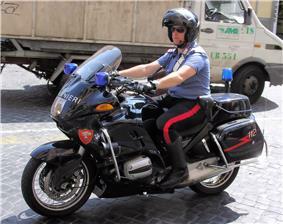 Some motorcycles are specially adapted for specific job functions, such as those used by the ambulance, Blood Bikes, fire, and military services, and for specilized delivery services, such as pizza deliveries. Some motorcycles are used to tow cars. Early cyclecars, with four wheels, were constructed more like motorcycles than cars, and were sometimes treated as a kind of motorcycle. The Dodge Tomahawk and Yamaha Tesseract concept prototypes, which resemble conventional two-wheeled single-track motorcycles, both have two front wheels and two rear wheels, all four of which remain in contact with the ground when leaning to negotiate curves.